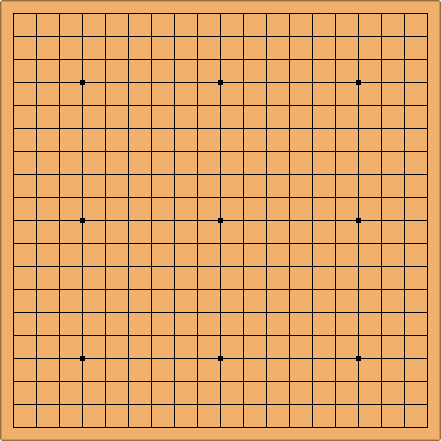 A go board is a 19x19 grid of lines . The Japanese go term for go board is 碁盤 (goban). The grid of a real-life go board isn't square but rectangular (about 8% longer than wide). This compensates for foreshortening when you look at the board. The go stones are played on the intersections, including the edge of the board (the outer line), and the corners where two edges meet. Dots at the nine star points, or hoshi, help the players orient themselves, and mark the location for handicap stones. The center start point is called tengen in Japanese, tianyuan in Chinese, or chunweon in Korean. Some wonderful pictures at http://www.goban.co.jp/koutei.htm show the traditional art of these boards' construction. Although the term goban is generally recognized and used by Western players, many English speakers avoid it, preferring instead the native English go board, or simply board. Goban is widely used, however, in other languages, including French and Dutch, which may not have such convenient native terms. Some people use goban, incorrectly, to refer specifically to a Japanese go board with legs. In Japanese the word indicates a go board of any shape or form. To specify, the floor goban with legs is called ashituki goban (足付き碁盤 'leg-attached board') and one without legs takujouban (卓上盤 table-top board). Other sized go boards exist. Commonly used alternative sizes include 9x9 and 13x13 boards.